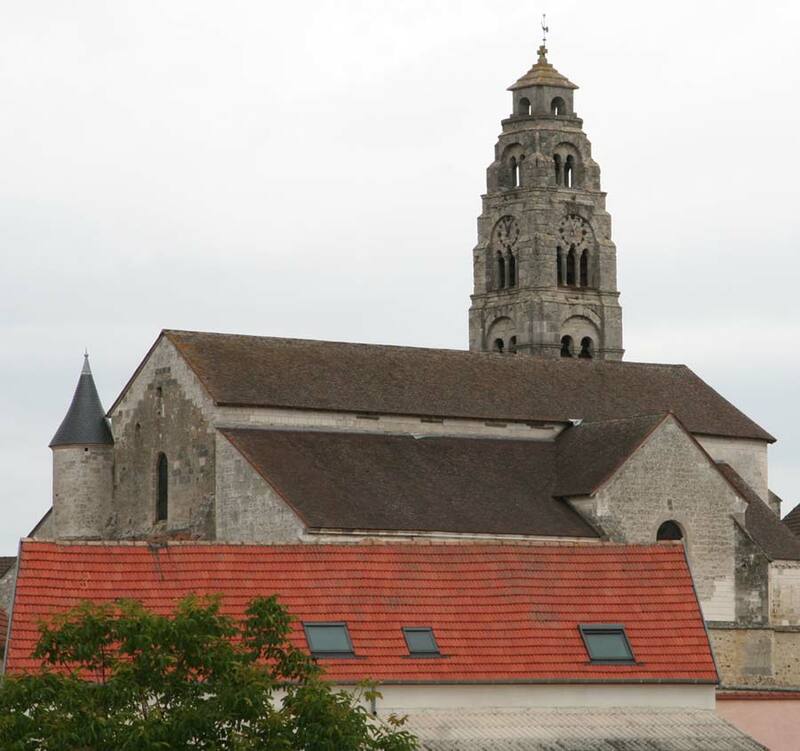 After a relaxing three days in Epernay we set off again today, leaving behind the Marne valley and starting a new phase of our journey along the eastern French canals. With an outline plan to head for Belgium, and then the Netherlands we would travel a short distance on the Canal lateral à la Marne as far as Condé-sur-Marne, before branching north on the Canal de l'Aisne à la Marne towards Reims. The bridges on this stretch of canal are true to the Navicarte's predictions, all between 3.5m and 4m. Fortunately, it was a fine morning and we could dismantle the canopy, radar arch and winch in order to pass safely under and still not get wet. We were also close to the maximum beam which would comfortably fit through the locks, the smallest of which are only 5m wide. So it was off with the giant fenders, and down to the super skinny variety. They would all end up covered in green slime so we were happy to use our older ones which we keep for just such occasions. The automated locks are operated by a handle which dangles in the middle of the canal a short way ahead of the gates. Once we got the hang of it they seemed to work smoothly, although some boats obviously struggled, as we came upon one lock where a queue of four boats had developed whilst the student VNF attendant was called out. 'Er is kaput' called out our Dutch neighbours, but in fact it only needed a little manual intervention to get the lock working again and move everyone through. 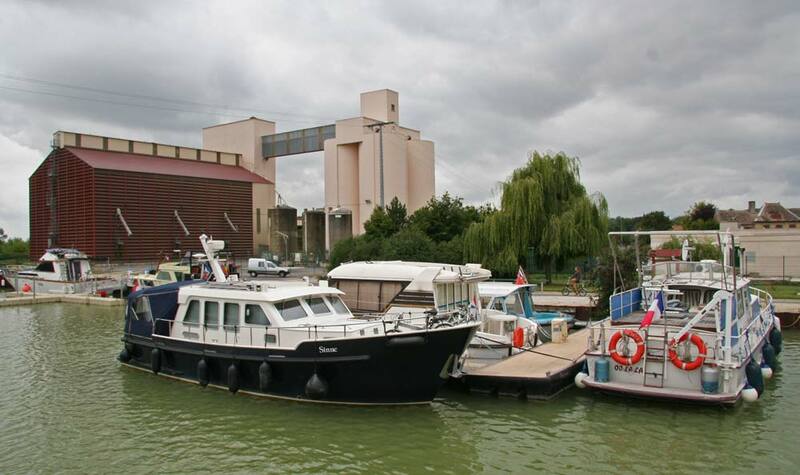 As rain threatened for the afternoon, we stopped at the junction of the two waterways at Condé sur Marne, which is a village which does not present its best face to those arriving by boat. Attractions turned out to be limited in what the Navicarte described as a large market town. Obviously written some years ago, the 'market' turned out to be an antique wooden structure which wouldn't have looked out of place hosting a cattle market c1900. 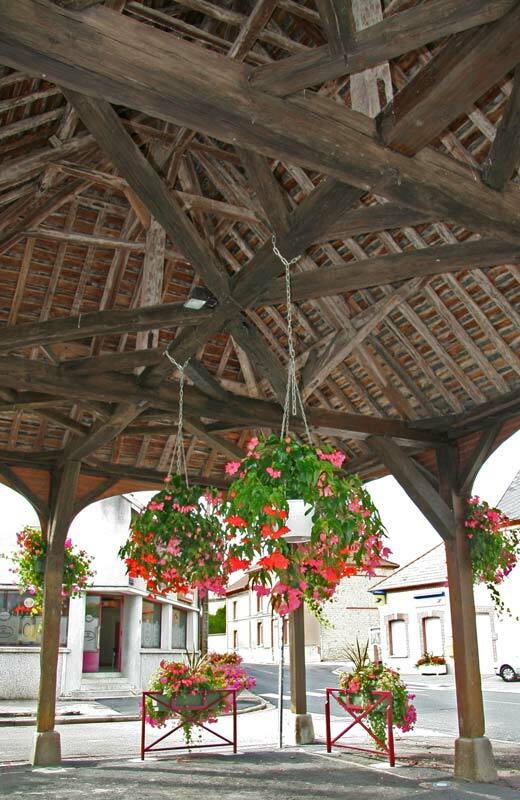 The 'large town' consisted of old farms and infill dwellings built in a matching style, whose main claim to fame are as one of the winners of the 'Balades Fleuries' contest - for which the main qualification seems to be extensive and imaginative use of flower baskets, and the bigger the better.